This is only a pack of 8 bearings. That means there is only enough for 4 wheels. First and foremost, I'm as picky as they come, I don't fall for the whole abec this and thatand the ceramic crap, 1. )this is aggressive inline, you need durability in a bearing and ceramic is not going to last....at all. 2. )many people fail to inderstand the importance of regular maintenance. With that said, these have become my go to/standard bearings. I rock these on anything that requires bearings because I know that they are up to the task. I have been riding one set for more than a yearnow amd they still feel as smooth as the day I bought them....why? MAINTENANCE! And because these things can take one hell of a beating. Best bang for you'r buck out there. 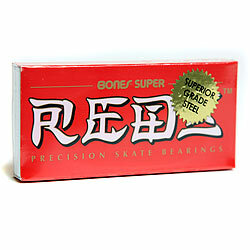 this are the best bearings there good fast and if u dont buy them your a skater hater.